Protein - Most mushrooms have a high protein content, usually around 20-30% by dry weight. This can be useful for vegetarians or anyone looking to increase the protein content in their diet. Fiber - Good amount of fiber in mushrooms will help in lowering cholesterol and is important for the digestive system. Niacin & other important B vitamins - As certain B vitamins are found in animal tissue but not plants, this can be another good supplement for vegetarians. Vitamin D - Essential for the absorption of calcium. Copper(Cu) - Aids in helping the body absorb oxygen and create red blood cells. Selenium(Se) - An antioxidant that helps neutralize free radicals, thus preventing cell damage and reducing the risk of cancer and other diseases. Mushrooms contain more selenium than any other form of produce. Potassium(K) - An extremely important mineral that regulates blood pressure(BP) and keeps cells functioning properly. A large portobello mushroom is said to have more potassium than a banana. Wash and slice white button mushrooms. Heat 2ts of oil in non stick pan and add cumin + mustard + chana + moog dal+ red chili and wait until they splutter. Add onions and green chili and saute until they the onions become transparent. Add turmeric & Ginger-garlic paste and cook for few min and add sliced mushrooms and cook under medium flame by closing the vessel. when the mushrooms are done, add tomato puree and cook until the raw flavor of tomato vanishes add little water if necessary. Finally add salt to taste, red chili powder and cook for few minutes under medium flame. Check for taste, adjust salt. Garnish with cilantro and turnoff the stove. 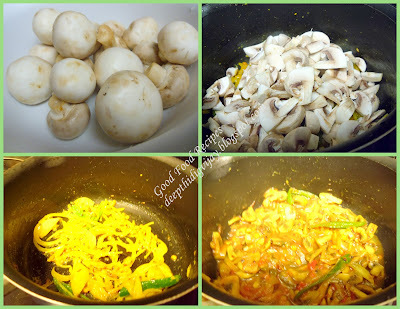 Serve hot with poori/chapati/ rice. Hope you like my recipe.plz come back again. A little variation of tadka is nice for a change..I make it almost the same way too...but I use chopped tomatoes and not the puree. Nice side dish for chapathis. Lovely dish, very colourful. Loved this a lot. This sounds nice. also the nutrition facts are good. i love mushrooms and i must try this.